The opening sentence of Hubert Wood’s catalogue to the holdings of the Irish Public Record Office is ominously prescient. He observes that Irish records have “suffered more in the way of loss of valuable material”. Writing in 1919 he goes onto list, in an impressive 300 pages, hundreds of historical documents that were in the record office in 1919. Just three years later most of what he had listed was destroyed. 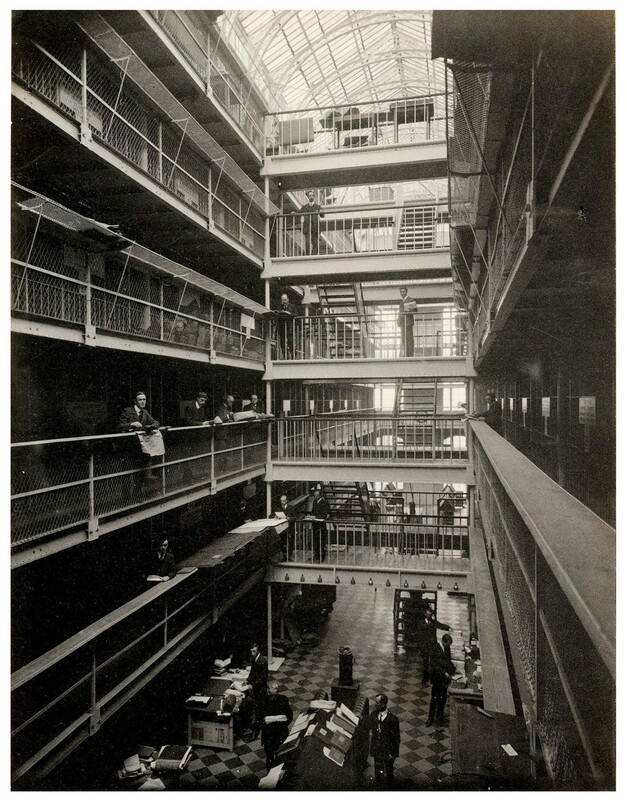 Housed in a separate building four storey building in the west corner of the Four Courts complex on the north quays of the River Liffey the Public Record Office of Ireland held within its walls the history of Ireland. In the 1860s thousands of documents were brought together for safekeeping in this specially built repository sealed with steel doors and with bridges separating the public area from the record treasury. The parchment and paper scrolls and documents, many dating to the 13th century, were a treasure trove of legal proceedings, court appointments, ecclesiastical records and genealogical records: censuses, wills and parish registers. Knowing what happened next it is especially poignant to read the very ‘proper’ Reading Room Regulations. These polite rules, for a polite society were no defence against the occupiers’ decision to use the record treasury as a weapons store, or against the bombardment they were subject to at the end of June 1922. 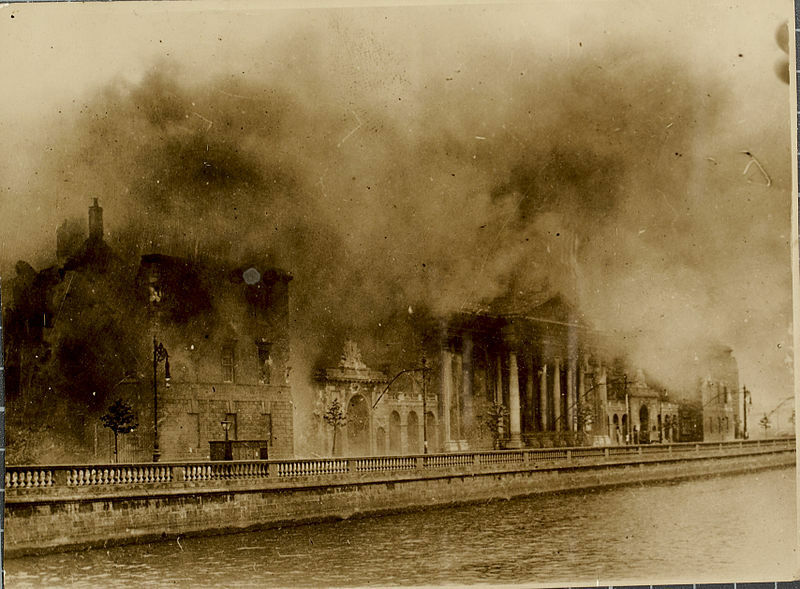 On the afternoon of 30 June 1922 a huge explosion rocked the city, the building was destroyed and a plume of smoke billowed up carrying with it burnt fragments of documents which fluttered down all over the city. In the days afterwards the government asked that people return anything they might have found. Very little was handed in. Wood suspects that the majority of fragments that were picked up were kept as souvenirs. Makes you wonder what attic they might be lurking in, waiting to be found. In Wood’s catalogue census returns, so dear to the heart of family historians, are rather ignominiously listed under ‘Miscellaneous’. Destroyed in the fire were the returns for 1821, 1831, 1841 and 1851. Those for 1861, 1871, 1881 and 1891 had been pulped at other times. Also destroyed were about 1000 Church of Ireland parish registers, those that survived were not in the record office, they were still held in their local churches. Lamentable though the loss of these records has been to family historians there are records that can be used to piece together a lot of what was lost. Family historians have proven ingenious in their approaches to circumvent the losses and a huge amount of work is also being done by institutions such as the National Library and the National Archives to bring what did survive online, ensuring its availability for future generations and to researchers across the globe.